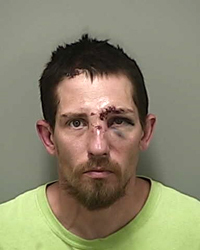 A 35-year-old Hailey man has been charged with burglary and aggravated battery, both felonies, for allegedly illegally entering another man’s apartment on Oct. 1 and striking the man with a baseball bat. According to a Hailey police report, the defendant, William E. Minear, was also injured in the altercation, having been struck several times with the blunt end of a hatchet by the apartment occupant, Walter “Butch” Cochran. Hailey police Lt. Steve England explained Tuesday that Minear was charged with burglary because Idaho law provides that burglary can be charged if someone illegally enters a residence with the intent of theft or committing a felony. The felony in this case being, England said, that he allegedly struck Cochran in the head with the bat. England said Cochran has not been charged with a crime because he was defending himself in his own home. Both men were transported to St. Luke’s Wood River hospital for treatment of head wounds. A probable-cause affidavit written by Hailey Officer Todd D. Peck states that he was called to Cochran’s Valley View Apartment in southeast Hailey because of an altercation shortly before 9 p.m. on Wednesday, Oct. 1. Peck wrote that when he arrived at the scene there was blood throughout the apartment and that Cochran was on top of Minear threatening him with the hatchet. Peck wrote further that through investigation it was determined that Minear came to the apartment with the bat and pounded loudly on the door several times before Cochran, with hatchet in hand, finally opened the door. Once the door was opened, Minear allegedly entered the apartment, without permission, and began striking Cochran with the bat. Minear was arrested on Oct. 2 and had an initial court appearance on Oct. 3 in Blaine County Magistrate Court. Hailey attorney Cheri Hicks was appointed public defender. Minear remained incarcerated Tuesday in the Blaine County jail on $50,000 bond.